There's an old saying: "Practice makes perfect." This applies to just about all things, but especially to shooting. Without practice, you'll never have the skills you need come time to employ a firearm. Be it hunting or personal defense, your skill is equal to your time spent training. 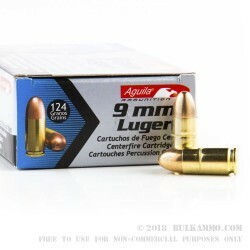 Strip away all excuses with Aguila's 9mm luger FMJ ammo. 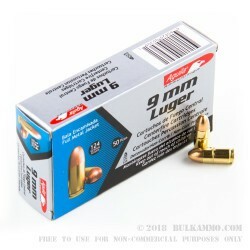 As some of the most reliable ammo on the market, Aguila's 9mm luger rounds are perfect for practice or big range days. You can rest assured your ammo will not fail you when you're practicing with Aguila, and with a case of 1,000 rounds, you will be able to practice for even longer! Aguila's 9mm Luger FMJ rounds weigh 124 grains and exit the barrel at 1,115 feet per second, producing 342 foot pounds of energy. 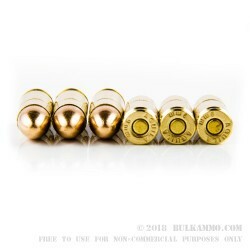 The cartridges are cased in boxer-primed brass, making them safe for reuse. They come packaged in plastic trays of 50, wrapped in cardstock boxes branded "Aguila 9mm Luger." This case contains 20 boxes. Good stuff for practice. The price is pretty good for the performance. It is not particularly dirty and my wife and I have had no functional problems in about 350 rounds. No sense always practicing with good hollow point +P ammo, it is just too pricey, so we practice with this and occasionally practice with the high price brand.